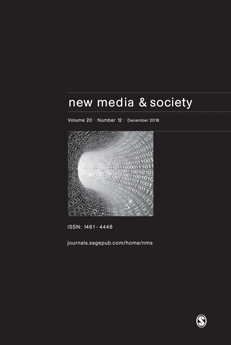 New publication by Tom Dobber, Damian Trilling, Natali Helberger, and Claes de Vreese in New Media & Society, titled: ‘Spiraling downward: The reciprocal relation between attitude toward political behavioral targeting and privacy concerns’. Click here for the article. Abstract: Tailored political messages are increasingly prevalent in election time, but we know little about how people perceive such data-driven and potentially privacy-infringing techniques. This article examines how demographics relate to privacy concerns and attitudes toward “political behavioral targeting” (PBT), how privacy concerns and attitudes toward PBT relate over time, and explore their relation with autonomy, electoral deliberation, and chilling effects. Using a three-wave panel study, administered in the Netherlands (N = 879), we examine a potential reciprocal relation between attitude toward PBT and privacy concerns, which may form a negative reinforcing spiral dynamic over time. This dynamic could result in undesirable behavior of the voter from a democratic viewpoint (e.g. chilling effects). We find that demographics fall short in explaining privacy concerns. More importantly, we find evidence for a reinforcing spiral dynamic and, by doing so, contribute to the discussion about the threats and promises of PBT to society.